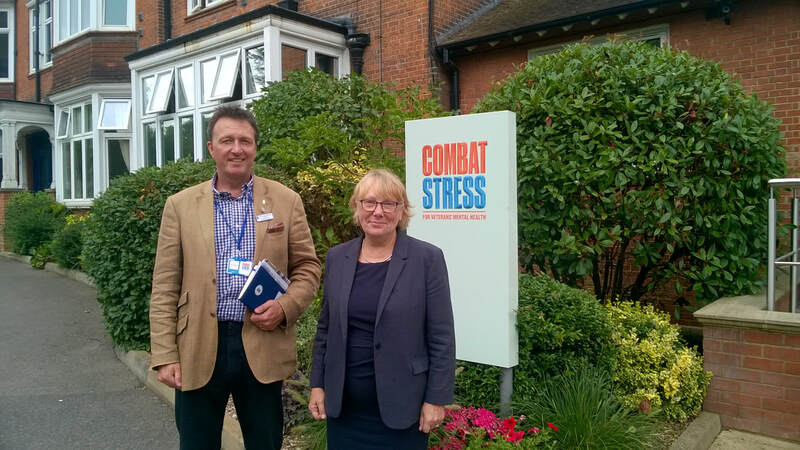 Association Chairman Chris Parker thanks Sue Freeth CEO Combat Stress after the visit day. 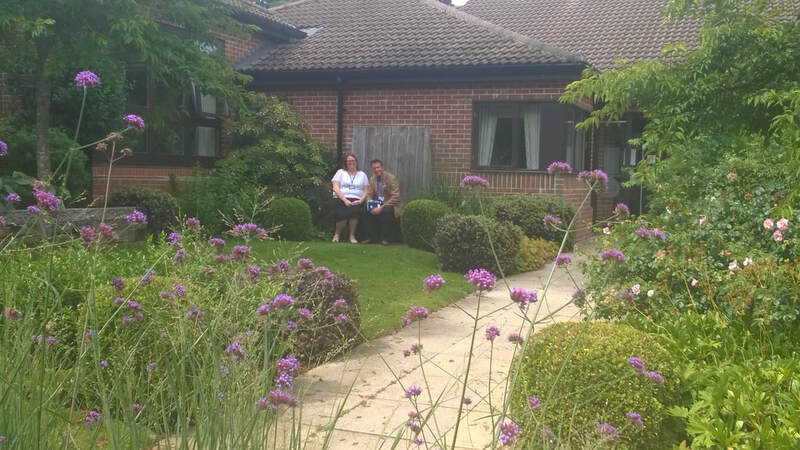 Diana White (RHQ PWRR Asst Regt Sec) & Chris Parker try out the relaxation garden. Combat Stress have a very good attitude to veteran care and are improving services each year. See their website. We all are as dealing with veteran mental health (MH) issues is a huge challenge as there is a big stigma and reluctance to speak up about it. That will get better but we in the Association always are there for fellow Tigers. The UK national MH expertise is growing and our part as veterans is to treat MH as any other normal injury like a knee. In the future we shall relax and feel open about it. You see the medics, it gets treated and you can crack on... Plenty have done and will tell you so. See the Happy Tiger page for more. Why are there 2 helplines? One is for serving one for veterans but they come to the same place so it's ok.
Can overseas Tigers get help? Yes there is a plan to get online/video referrals for Tigers overseas from late 2018. Why have some lads not been admitted as too risky? Combat Stress is a residential treatment centre; a hospital is where severe cases will go. Can you get travel costs paid? Not really their role but if you are really struggling ask RHQ Welfare for travel support. Why can families not refer guys? It must be the individual by UK rules but call RHQ and the Association can help encourage attendance. Why does it take so long to get an appointment? Like any healthcare there is a waiting list as expensive doctors can't sit around in case; PWRR are able to support you whilst waiting via a new scheme where we support the family and the veteran. Is it for serving or veterans? Mostly veterans as serving should use military med chain but the helpline can advise you and families in confidence if serving. Biggest advice I have is to just call them as it is 24/7...so much better after a call, everyone who did that said to me. What Courses are there? You can get referred onto the main 6 week course (which seems top and v popular) as well as week long anger management and others. They help steer you to the right treatment, amongst soldiers, with medics who really 'get who you are and what you have been through'.